Fig. 6. 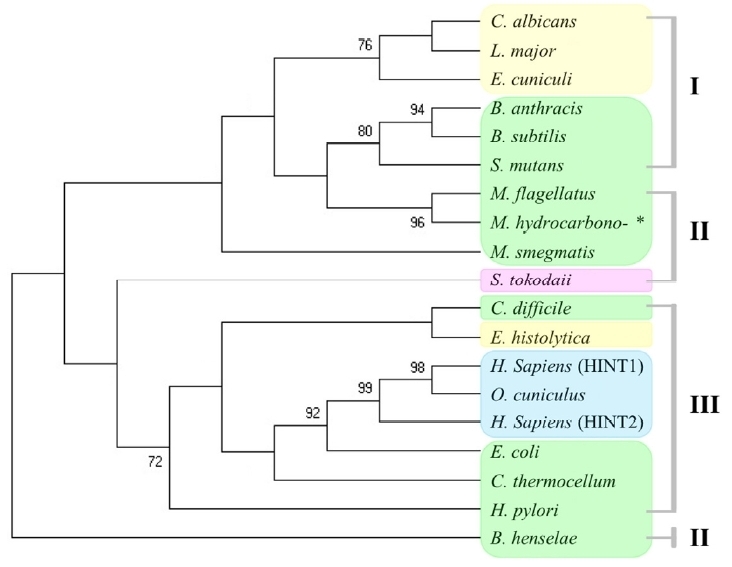 The phylogenetic tree inferred from the HINT gene with bootstrap percentages for 1,000 replicates. No outgroup was included due to the large divergence in this study. Bootstrap values under 70% are not shown. The full names of the genera with species are shown in with abbreviations. The yellow and green highlighted species indicate eukaryotic cells (including protozoa and fungi) and bacteria, respectively. The pink and blue highlighted species represent archaea and animals, respectively. Three groups based the types of C-terminal regions are shown on the right side of the figure. *Marinobacter hydrocarbonoclasticus.